The identity of the artist that signed a series of airbrush paintings as "Gill", has remained a mystery to this day. Not even a first name or the gender of the artist is known. Yet, the artwork that he/she created during the 1930's in a Honolulu atelier, is some of the most sought after and enduring Hawaiian Vintage art created during the "Golden era" of travel to the Islands. The finely crafted and elegant porcelain figurines we offer here have been created based on these Art Deco paintings and are a true to the original art in detail and coloring. Please take a close look at the facial features and the graceful poses! The large figurines measure approximately 10 inches in height, the smaller version and the Christmas Ornaments come in 4 inch size. 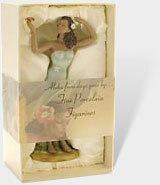 All figurines are made of the finest porcelain and are packaged safely in a handsome gift box. Collect yours today! These beautiful figurines are handmade and never identical.